The opportunities and challenges for healthcare stakeholders include standards, governance and workflows as telehealth, which "has passed the tipping point of market momentum," gains traction nationwide, according to the ATA’s report Telehealth Interoperability: Driving Choice, Continuity, and Scale. "In many cases, telehealth clinical services and settings are fragmented and data is siloed, with low-volume telehealth services such as those for specific locations or clinical specialties standing alone rather than being designed as part of a larger, integrated system," according to the ATA. "As these fragmented systems proliferate, they result in costly, redundant software infrastructure and endpoints that limit the potential to improve overall quality and access to care," researchers wrote. "These fragmented systems also make it difficult for payers (government agencies, private insurers, and employers) to gain access to the comprehensive member data needed for claims and utilization management systems, and add to the challenges of performance tracking, reimbursement, and incentives." And its specifications are also evolving as the technology and implementations mature. For example, when it comes to video conferencing, "robust standards including SIP/H323 exist but new options such as WEBRTC are making seamless connections possible in any browser without having to download additional apps. The industry can help evolve these standards and make medical devices work seamlessly as part of video conferences." "The patient experience will not be complete without integrated communication platforms to accompany the on-demand or scheduled telehealth encounter," researchers write. "Interoperability must incorporate communication platforms across the gamut of secure paging, texting, IM, chats, video, phone/VOIP, faxing/e-faxing, and scanning. As standards, specifications, and interfaces become more robust and more broadly implemented, they will support an even richer telehealth infrastructure and a seamless clinical experience." Clearly, telehealth's moment has arrived after 30 years of incremental progress, not just in the U.S., but worldwide. But for distance-based care to truly succeed, it needs to address many of the same interoperability questions that the rest of healthcare is grappling with in earnest. And that's in addition to other sticking points, such as those outlined in a recent RAND report, which found that safety net providers – among those who most stand to benefit from telehealth – are dealing with challenges related to infrastructure and broadband, technology costs, lack of buy-in among providers, complexities in adjusting clinic workflows and more. "Experienced health systems are defining near-term clinical requirements and connecting with like-minded technology vendors and payers," said ATA officials in the report. "Investments and aligned financial incentives are creating an environment to demonstrate the value of integrated clinical services that leverage interoperable platform technologies. And government and private payers, along with policy advocates, are working to increase incentives and favorable reimbursement models for broad-based telehealth implementations to help drive continued improvements in cost, quality, and access." "Interoperability of telemedicine will define its future," said Dr. Andrew Watson, president of the ATA and vice president of clinical information technology transformation at UPMC, in a statement. "In the era of value-based care, understanding data and how telehealth relates to the frontline care systems of both payers and providers is critical. 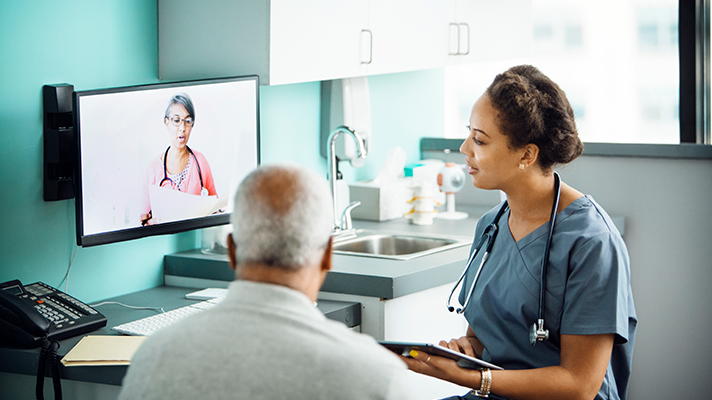 For telehealth to be relevant – and even to be a frontline system itself – it must be interoperable for ease of use, cost of integration, security, and patient/member identification. This important interoperability initiative governs much of the promise for the future of telemedicine."